I know Tim likes Altereds, and I suspect quite a few of the rest of us do, too. Any interest in an Altered CBP? Well, since I just started building one, I would be interested. Yeah, somebody took the link out, even though it's to a site that just has pictures of real drag cars, no models at all, NO competition with this site whatsoever. I just don't understand this joint's policies sometimes. I'm up for trying one could u send me the link jhpmft73@aol.com thanks ! 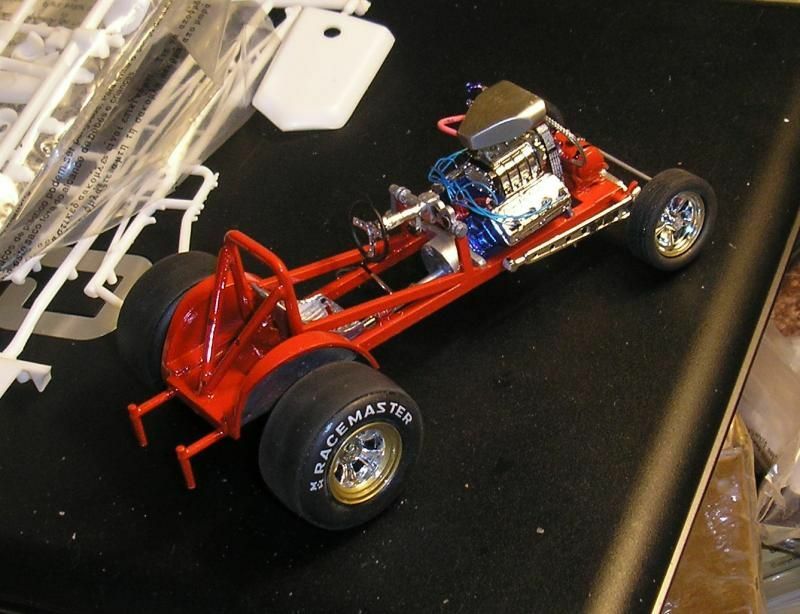 "Funman1712" is the board name for Scale Auto contributor Tim Boyd. And for those who aren't "into" Ts, Bantams, and Fiats, don't forget that several of the wilder First Generation Funny Cars were rebodied Altereds. I can think of at least two Mustangs (maybe three) and a Corvette that were born this way, just for starters. And the Altered class was where several of the First-Gen altered wheelbase funnies went to live out their lives after the tube-framed floppers took over. There have been many, many types of Altereds over the years. Not just Fiats, Bantams, and T buckets. 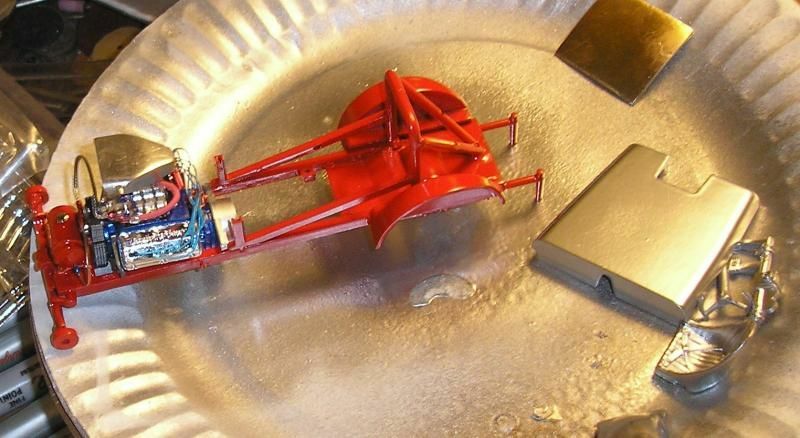 You can turn just about anything into an Altered. 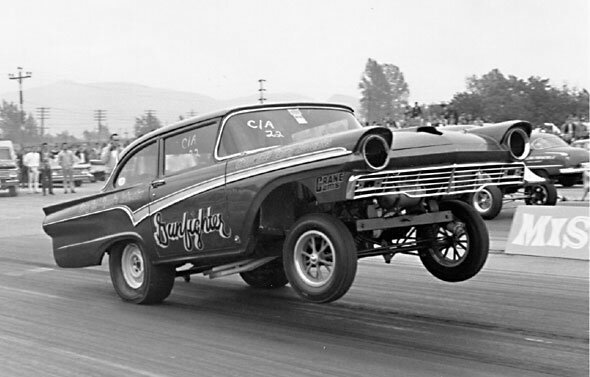 I am going to build a '57 Ford as a wild, 312 powered, fuel injected, altered wheelbase, show and go freak! WF, I'd have raised an eyebrow at your Ford a month ago, but at the site with all the great photos, there's one of a Ford not unlike what you're doing...and at least a couple of Tri-Five Chevies, too. Drive on! The inspiration for my project is an actual C/A race car from the west coast. That '57 Ford build of yours is really cool Walt. First time dealing with a poseable figure. It makes for a lot of work trying to get all of his parts in the right places! The real hard part should be wrapping him in a harness! Anyone else out there want to build one? Yeah, I have a couple in mind. Just got to get off my azz and get to work. I decided not to use the kit supplied Y-block in my '57 Ford. 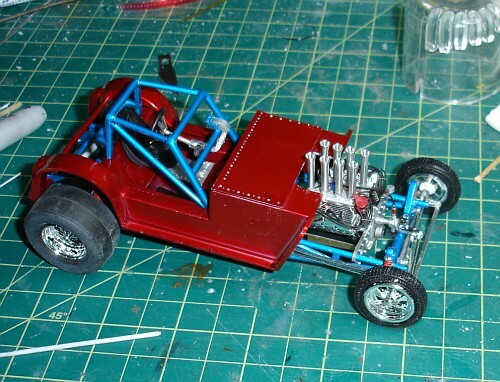 Just not enough time to make the fuel injection set-up that I wanted. So what did I replace it with? How about a 413 Mopar! Interesting! My go-to engine on projects like that is the early Hemi. Between Double Dragster kits and AMT Parts Packs, I've got several of them sitting around. I like to use early Hemis too. I tried one but the exhaust would not clear the cross member. 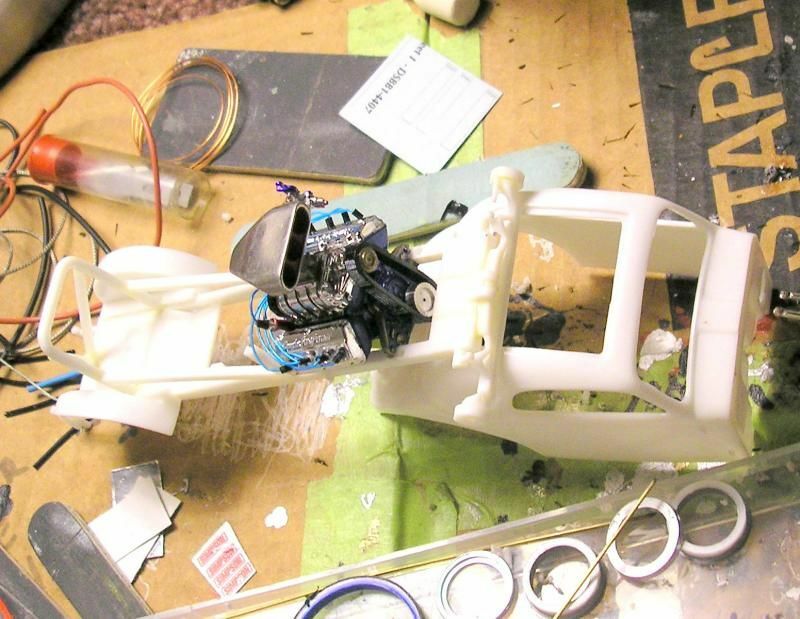 I could not remove the cross member because it mounts the front axle. 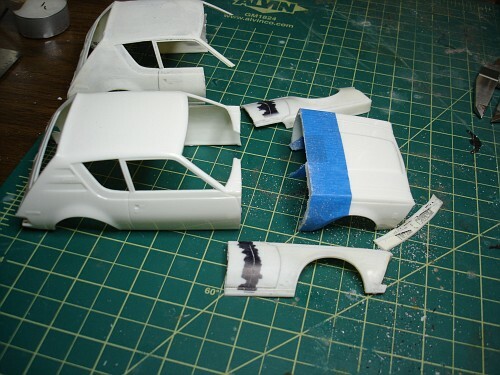 Real cars are so much easier to work on. Ever try to use a cutting torch on styrene? A 413 Max Wedge sitting uncomfortably in a '57 Ford chassis! Getting near to the end of this one. It's done and on the track!